Users with the Avalara online tax processing module have the sales tax for their orders automatically calculated. This module works anywhere in the US and Canada and eliminates the need for any tax rate setup. The sales tax reports are available online from Avalara, and they even have a service to automatically file your sales taxes for you in most locations. This document discusses the steps to set up Control for this processing. Ensure you are running Control 4.5 to ensure you have all the latest fixes.If you are upgrading from Control 3.x or earlier, do not upgrade with Control 4.4 or earlier. Apply for a merchant account through avalara_faqs. Obtain the configuration information from Avalara. Enter your account information in Control. Setup your NEXUS (tax status and jurisdictions) in Avalara's online setup. Convert your customers to use Avalara tax processing by default. Edit and save all existing WIP and Built orders to switch to Avalara tax processing. [Optional] Adjust your existing A/Rs so they are locked to the old tax rate. Always backup your database before making any tax changes … like now. Ensure you are running Control 4.5. Confirm that the Version number begins with 04.50 or higher. You can check if the module is authorized on the Database & Module info on Help | About Control … dialog. If you have “Online Tax Lookup” under the list of modules authorized then you already have the module installed. To order the module, contact Cyrious Technical support by emailing mailto:support@cyrious.com or by calling 888-552-9823 in North America, or 225-408-3075 outside of North America. After processing payment Technical Support can connect to your system and immediately authorize the module in your system. Apply for an account through Avalara. Cyrious Software only supports online tax processing through Avalara. To sign up, contact Avalara using the information found on avalara_faqs. Account #: Your account number. License Key: The license number from Avalara for Control. URL: The web address of the tax service. Company Code: This is anything you want, but must match exactly what you type in the Avalara setup as the Company Code. Enter your account information into Cyrious. Select online_tax_options on the list on the left.If you don't see this option, the Online Tax module is probably not enabled. Contact Cyrious Technical Support to purchase this module. Check the “Enable Online Tax Lookup” checkbox. Enter the configuration information provided by Avalara. 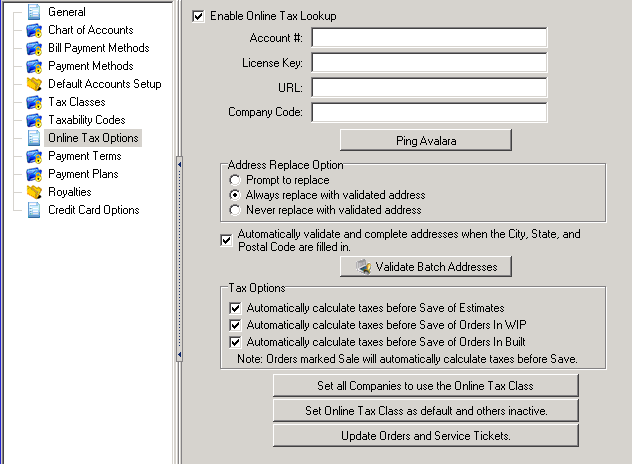 Select the address and tax validation options. For more information on these opions, click online_tax_options. Cyrious recommends you always replace the address with the validated address. Avalara can not look up the taxes unless it can positively identify the address of the customer. This will also help the automated post office scanners by formatting the address in the recommended format. Cyrious recommends that you automatically validate addresses for ease of use. Cyrious recommends that most users look up taxes at each stage of the estimate or order. For some users, when the pricing is not known until the order is complete or nearly complete, it might make sense to not look up the taxes until the order during these pre-sale stages. Click on the “Ping Avalara” button to confirm connectivity to Avalara's gateway. You should receive the response “Test Successful.” If you receive another message, reboot the server computer and retest. If you still receive an error message, contact Cyrious Technical Support. Set all Companies to use the Online Tax Class. As it describes, this option changes the tax class of all companies to use the online tax lookup. Customers with the “Tax Exempt” checkbox selected will still have this exemption selected, but all tax classes will be changed to the online tax class. Set Online Tax Class as the Default and All Others Inactive. This feature will set the Online Tax class to the default tax class and deactivate all other tax classes in the database. Only use when online tax calculations will be the only means of calculating taxes. Update Orders and Service Tickets. This feature will update the tax class for all orders currently in WIP, Built, or Sale or was closed within the last 3 months to the Online Tax class. The orders will NOT be recalculated. On the next edit of the order, the tax calculation will be performed and the order updated to reflect the new tax amount. all orders are registered in Avalara. you can check for any tax changes. all changes are grouped into one time period. Congratulations. Your system is now setup to process taxes online.